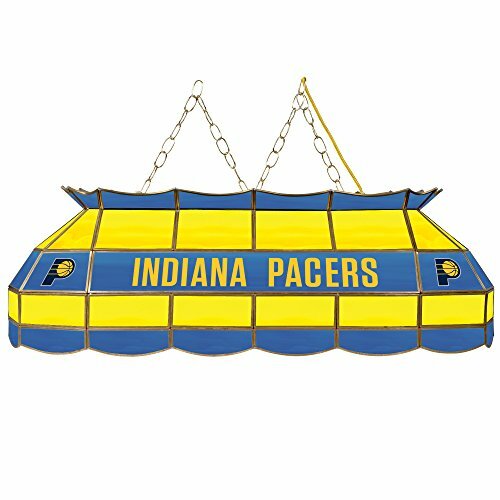 NBA Indiana Pacers Tiffany Gameroom Lamp, 40"
Illuminate your game room, garage or collection with an officially licensed 40 inch Tiffany lamp. This premium lighting fixture looks great on or off with officially licensed logos screen printed directly on the stained glass panes. The stained glass panes are accented by metal channeling and a hanging chain. Over nine and half feet of cord provides many hanging options. Brighten up your favorite area with this one of a kind officially licensed 40 inch Tiffany lamp. NBA Houston Rockets Tiffany Gameroom Lamp, 40"
NBA Portland Trailblazers Tiffany Gameroom Lamp, 16"
NBA Milwaukee Bucks Tiffany Gameroom Lamp, 16"
NBA Los Angeles Clippers Tiffany Gameroom Lamp, 16"
NBA Houston Rockets Tiffany Gameroom Lamp, 16"
NBA Minnesota Timberwolves Tiffany Gameroom Lamp, 16"
NBA Denver Nuggets Tiffany Gameroom Lamp, 16"
NBA Detroit Pistons Tiffany Gameroom Lamp, 16"
NBA Orlando Magic Tiffany Gameroom Lamp, 40"
NBA Dallas Mavericks Tiffany Gameroom Lamp, 16"